Wacky Wednesday! And what nation brought us more wacky cars than the French? I really would not know so here I present you a 1/43 Norev from Hachette’s Collection 2CV. And while a 2CV can be called wacky on it’s own, this one is wacky TO THE EXTREME! No photoshop needed to create this rebel. You’ll be amazed I’m sure. Not just because this little 2CV was used by the local Sapeurs - Pompiers (fire brigade) of the Cogolin commune. A region with lots of nasty and narrow forrest & mountain roads. And wildfires. In which the local fire fighters often didn’t even had a chance/possibility to turn the car. So the Fire Department came up with an idea to create a car that could easily go as fast forward as backwards. How? Let me visualize this for you. Yep. By putting two FWD fronts of two 2CV’s together. Because Vive la France, vive la difference! It all started by a reconnaissance mission of colonel Hourcastagné riding his Citroën Traction Avant. He got stuck somewhere on a small mountain road and had to drive several kilometers backwards, with his co-driver pointing out the road with a flashlight. So the fire department met with several property-owners of the area, got funding and bought two 2CV’s. These were sent to a Parisian coachbuilder who cut both cars behind their front doors and put the two fronts together. Resulting in a car with two engines, two transmissions and two steering wheels & mechanisms. Both steering mechanisms could be locked, you don’t want those “rear” wheels turning all directions at high speeds. 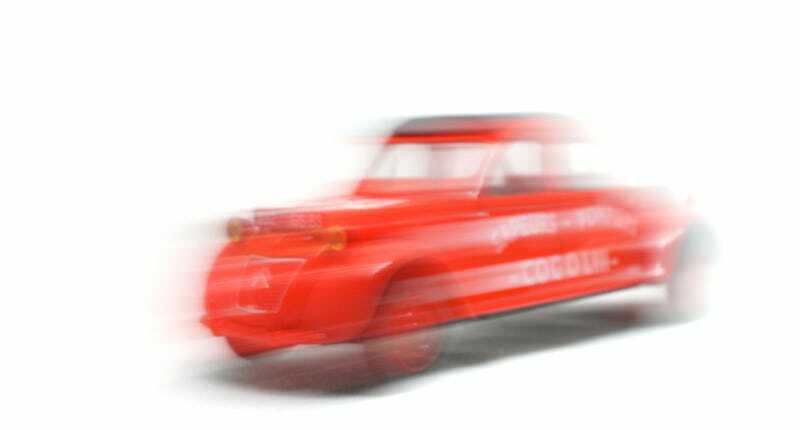 It could come in handy though, when using four wheel steering the Cogolin 2CV proved to be very maneuverable. The four wheel drive could only work at low speeds as when one engine was in first gear, the other would be in reverse. Only one thing the engineers didn’t think of. As the wheelbase increased quite dramatically they should have increased it’s ride-height. It did get stuck several times off-road. Due to it’s versatility and practicality it’s tour of duty was quite some time. It was put in service in 1956 (after a year of testing it) and retired somewhere between 1969 and 1971. In ‘71 it was removed from the fire station and it ended up in a storage facility in Draguignan. Last time anyone saw it was in 1995 when fire fighter Patrick Maunier wanted to buy it in parts to restore it to expose in the Cogolin fire station. After that encounter this one-off has vanished from the earth. A replica has been built by students of the vocational university of Lycée des Métiers Georges Cisson in Toulon. Check out this wacky thing in this youtube footage above. That one resides in the Cogolin Fire Station if I’m not mistaken, so Patrick Maunier should be satisfied after all. Et voilà pour aujourd’hui! Demain un autre casting Français. Avec une touche Anglaise. I usually end my French posts with Bon Week-End but that would be somewhat premature. So I’ll just finish with... Bon LaLD semaine de voiture!